This Meteor 'Exploded' Over Greenland, But Nobody Saw It. Here's Why It Matters. Since there aren't any images of the Greenland fireball, here's an illustration of a space rock burning up as it enters Earth's atmosphere. A fireball that streaked across the sky above the Thule Air Base in Greenland on July 25 was notable for not only the 2.1 kilotons of energy it released — the second-most-energetic "explosion" of its kind recorded this year — but also the stir it caused on social media and the frenzied calls it prompted to the U.S. Air Force. And the blazing rock — which was traveling at about 54,000 mph (87,000 km/h), about 74 times the speed of sound, according to The Aviationist — may have sent meteorites to the ground for passersby (the few people who happened to be this far north of the Arctic Circle) to discover. Apparently, the news reports that stemmed from those tweets led to a flurry of calls from reporters to both the air base and NASA asking about potential harm to the Thule Air Base, according to the Military Times. So, what's up with the fireball? 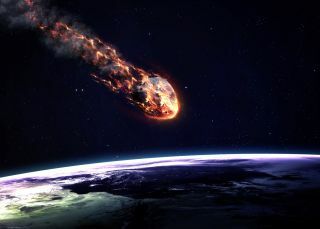 Though meteors like this one are large enough to create a blaze when entering the atmosphere, they are not big enough to be seen before they plow through Earth's atmosphere. "These objects are only a few meters across and smaller, which is too small to be detected before they strike the Earth," Robert Lunsford, a longtime meteor observer with the American Meteor Society, told Live Science. "Therefore, we have no idea when and where such events will occur." When this Greenland meteor ripped through the atmosphere last month, some 750 miles (1,200 kilometers) north of the Arctic Circle, some sensors in the global network run by the base's 21st Space Wing detected it. "As the meteor[s] enter the atmosphere, they ablate until they either completely disintegrate or remnants fall to the ground," Lunsford said. "The shock wave generated by the collision with the atmosphere is the source of the 'explosion' and resulting estimate of impact energy." These objects are too small to cause much damage, unless someone gets hit by a fragment of the rock or if someone is near the sound blast, he said. That did indeed occur in 2013, when a 55-foot (17 meters) meteor struck Chelyabinsk, Russia. The shock wave from the impact smashed windows and damaged buildings, and more than 1,000 people were injured. For comparison, that fireball packed 300 kilotons of energy, or 20 to 25 times more energy than the atomic bombs dropped during World War II. Even so, the Chelyabinsk impact was much less powerful than the Tunguska meteor explosion in Siberia that released 10 to 15 megatons (10,000 to 15,000 kilotons) of energy in 1908, Live Science previously reported. Though the Greenland fireball explosion was significant, nobody saw it. "Being that it was such a remote location, there are no pictures of this fireball," Lunsford said. "In fact, we have not received any visual reports, either. If not for the U.S. government sensors, we would not even know about this object."